That’s all it takes to make life more difficult that it needs to be. A single hiccup can derail even the best laid plans, put you on the back foot, and have you fighting for something that should come to you freely. It’s no different with Facebook Messenger. Break the rules and you could find yourself on the end of a penalty that prevents all sends. You could find yourself a marked merchant making future infringements come with a heftier penalty or permanent ban. Your business depends on you knowing not only how to effectively leverage different sales channels like Facebook Messenger, but on doing so in a way that abides by the rules. 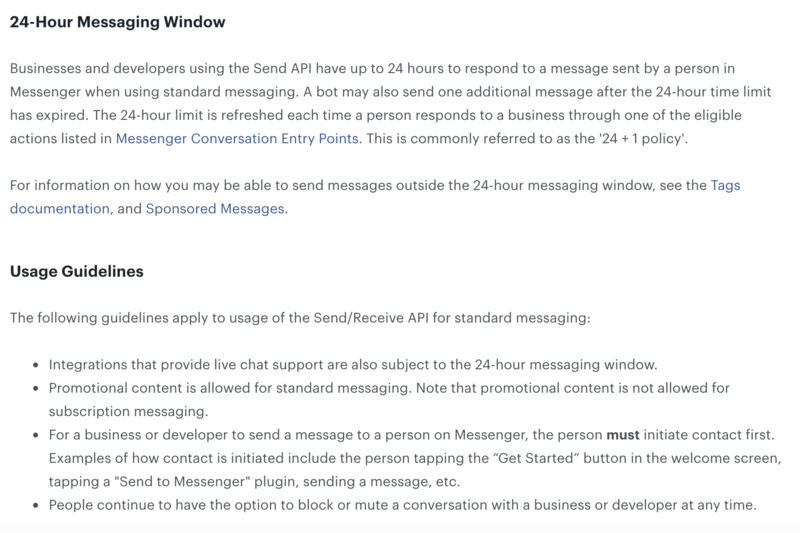 Problem is, Messenger is a relatively new channel and there’s a lot of confusion over what the rules are. It seems like every few months there’s an amendment to existing rules or an increased enforcement of established rules. To clear things up, we’re going to keep this single, updated collection of the key rules and regulations you need to know to keep your Messenger campaigns profitable and above board. Before we get into the specifics, there’s one thing you should note. One single undercurrent which, if followed, should keep you clear of any potential issues. That main consideration is to not be a skeezy marketer. Basically, be a little more ethical than most with your marketing. Don’t take liberties because you think it’ll drive more sales. That’s the main thing you have to remember here. It’s not too complex or confusing, just be reasonable. But let’s move away from these vague descriptions and detail a couple of exact actions you need to take to ensure you don’t get banned from this incredible medium. A year ago I opted in for an ebook from a brand I respected. I handed over my email address and, within minutes, saw a PDF copy of the ebook I wanted drop into my inbox. All was well and good and as expected. However, after a week, I was receiving daily emails from this business completely unrelated to the opt-in I’d selected. It goes without saying I was annoyed. As soon as I realized this wasn’t a one-off but a planned strategy of theirs to keep messaging me what they thought would make them more money, I unsubscribed. And yet, I still received emails. There was, apparently, a notice that opting in would enroll me in numerous lists. A notice which was so hard to notice I completely missed it. Because these guys were so underhanded in their messaging I’ve since broken all contact with the brand. It’s a risk you run every time you get someone to opt-in to your Messenger. The easiest way to mitigate this is to very clearly highlight what the user is opting in for. 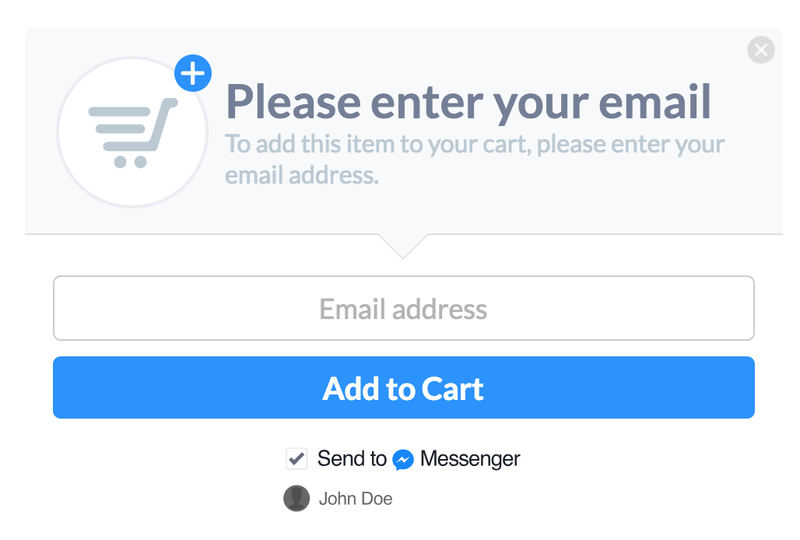 With Recart, we made sure this isn’t something the user can miss by placing a clear opt-in tick box below the email field so people can choose Messenger instead if they choose. Once you’ve got the option sorted, you have to follow up accordingly. When you opt-in to an email list you’ll always get an immediate email to confirm your subscription. The best email confirmations out there also take the time to let you know what you’ve opted in to. They set expectations so the user isn’t surprised and doesn’t unsubscribe the first time you reach out to them. 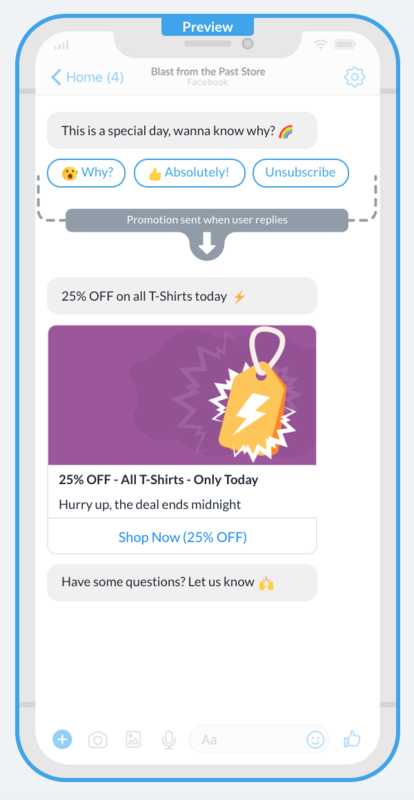 You should be adopting the same method with your Messenger campaigns. 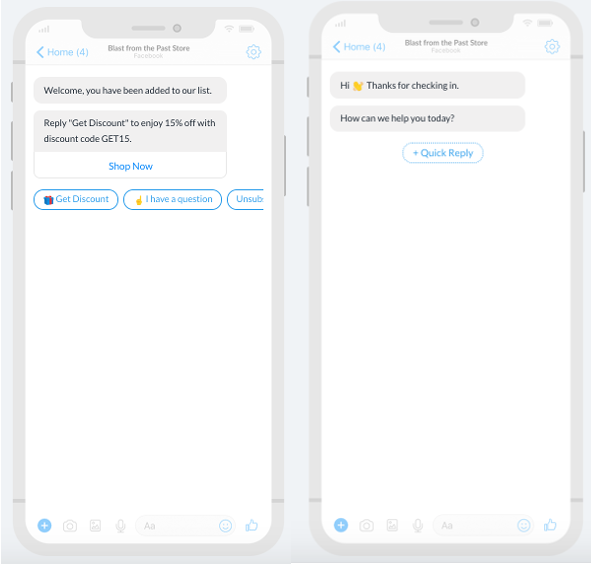 As soon as someone ticks that little opt-in to Messenger box and confirms, you need to reach out so they can see what Messenger marketing looks like to them. The below is an example of the default confirmation message Recart will send. Whilst the above is a good starting point, you’re going to have to customize the welcome message based on how, where, and why the user subscribed. For example, on the left below is the default message we recommend when welcoming people who opted in through Wheelio or through a discount opt-in. On the right, a message for those using Recart’s live chat function. Subtle difference, but the relevancy will go a long way into establishing those first little bits of trust with your audience. Before we move on, I should also say that you shouldn’t rely on the defaults. These are placeholders until you can create something that better represents your brand image – but more on that later. Facebook has very specific rules o what you are, and are not allowed to do on their platform. If you break those rules, you’re going to find yourself in hot water and could even see your access to Messenger revoked. Generally speaking, abiding by the rules isn’t all that hard. As outlined at the beginning of this piece just try your best not to be a sneezy marketer. That should see you right for 90% of your actions. However, there are 2 other closely related rules you should be aware of. Those being Facebook’s 24 + 1 rule and the upcoming changes to subscription messaging. The 24 + 1 rule is something that confuses a lot of folk, but when you break it down it’s actually pretty simple. In short, you only have 24 hours after a customer contest you through Messenger to send them promotional messages. That means things like cart abandonment messages or notices of flash sales can only be sent within 24 hours of the user’s last message to you. You then get 1 extra message outside of that window as sort of a last hurrah. Because of this, we recommend spreading your cart abandonment messages out to make the most of the time limits. Send the first message after 1-3 hours. The second should go at around 23 hours. And the third and final message anywhere from 36-48 hours after the abandonment. That will keep you top of mind without breaking the rules. Any sort of messages sent outside the 24 promo window fall into the subscription messaging category. As a rule, you’re only allowed to send messages that fall into one of three categories detailed below. We built a feature into the instant message solution within Recart to get around this. 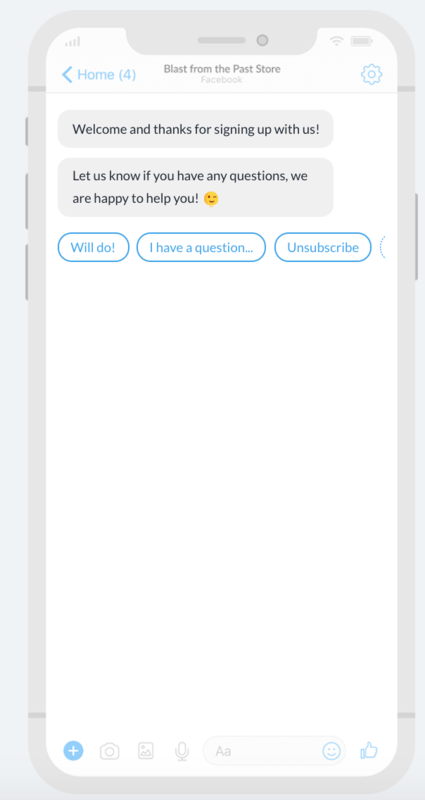 Y asking the user a question that’s not a promotion you get them to engage which resets the promotional 24 hours you get. However, as detailed here, Facebook are changing the rules and tightening up on subscription messaging and moving the permissions from apps like Recart to your page. No one is white sure what this means just yet, but it likely means the subscription messages will be more closely policed. That change is also bringing in authentication for subscription messages.If you’re not authorized to send them, the option will be blocked for you. I ran a couple of tests on how to ensure you get approved for subscription messages which you can read about in this piece. Messenger marketing is a huge deal now. You’ll hear people (including me) boasting about the massive open rates, insane engagement, and increased sales when compared to transactional emails. However, what very few people seem to be talking about is how to optimise your Messenger campaigns. People use the existing high engagement as a crutch for their own laziness. Instead of looking at improvements, they sit back and admire their already high engagement. 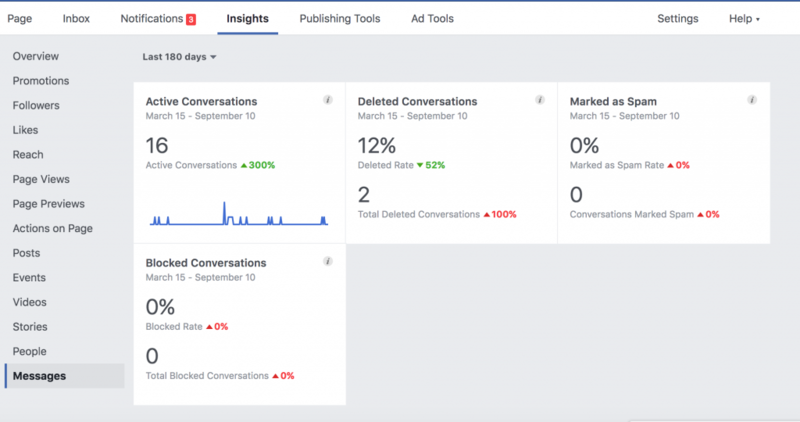 There’s two different statistics you should be looking at when optimising your Messenger campaigns. The first I’ll look into is in the Recart dashboard. The below is a Recart test account where I’ve sent a handful of messages to highlight this point. Straight away we can see that there’s a problem. We’d expect to see a reduction in the open and click rates as more messages are sent – those who fail to engage on the first point of contact will typically be harder to win over. However, if you look at the second message you can see that it has a much lower CTR and has made 0 sales. That is the first thing I’d want to look at. Unlike email, we don’t have to worry about subject line, but we do ave to make sure the opening line of the message is super compelling. This is the second message as it stands. Instead of leading with “Don’t forget your cart” I might get better results by leading with the saving. 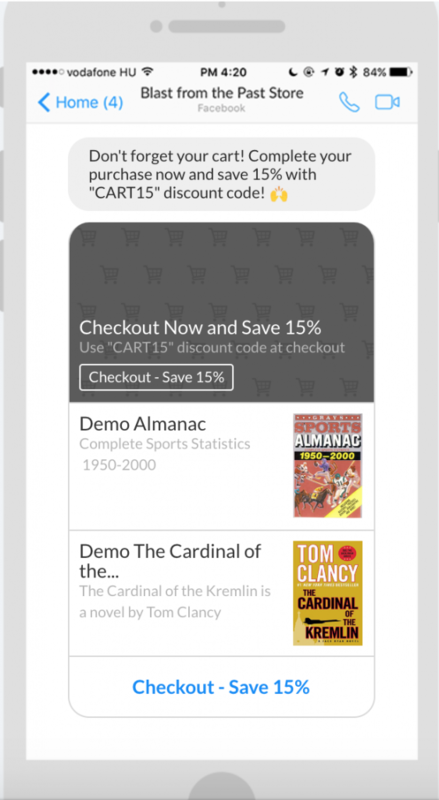 Saying something like “Claim your 15% off now!” as the opening might increase open and clicks as that’s the thing that will definitely show on the user’s lock screen. Go through each of your Messenger campaigns and see where you’re falling short and how you can improve them. If you head to the Facebook page your Messenger account is linked to then head to insights and Messages you’ll see something like the below. This is a god indication of how your messages are being received overall. If you see a high level of spam or blocked conversations you might want to look into both your subscription messages content and maybe play around with the timing of your abandon cart messages so they go before the user forgets when they interacted with you. There’s no clear indication of how these are tracked so there’s not much you can do to really optimise these. As a general rule, we recommend experimenting to keep spam and blocked percentages as low as possible. Ok, so there’s a tonne of guides out there detailing how to write killer Facebook Messenger messages. I even created one here on the Recart blog which covers all the major areas you need to know. However, one area that’s very rarely covered is that you have to inject your brand’s personality into your messages. If you don’t they’re going to come across as boring and dry. Don’t be afraid to do something a little different to all the dry templates out there. Make sure that, even at a moment’s glance, your users could pick your message out of a line up because it simply screams the brand personality you’ve developed. You’ve spent the time to build a brand personality, so don’t let iy go to waste. I’ve covered the basics now in this piece. If you haven’t yet got your Messenger campaigns underway, be sure to click the button at the top of this page and sign up for a free trial. If you’re already printing money with Messenger but think I haven’t covered something, drop it in a comment below and I’ll see about including it.